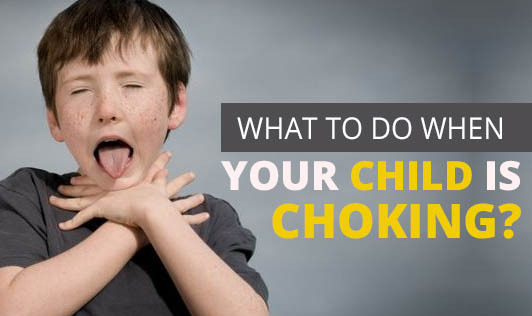 What to do when your child is choking? Children usually put small objects in their mouths. This is their way of exploring things around them. However, small objects like marbles, small toy parts or even food can get clogged in the child's air way resulting in choking. • Swallowing objects like marble, beads, toy parts etc. • Shape of the food. Tubular and round foods increase the chances of choking. • Texture of the food. Food which slips into the throat easily, or hard food and fibrous food can cause choking. What to do in case of choking? • Encourage your child to cough as loudly as possible. This will send out the choking object. • Give back blows to your child. Make your child lie on your lap on their stomach or ask them to bend down and give 5 sharp back blows. • If the back blows do not work, give them chest or abdominal thrusts. Put your arms around your child from behind. Clench your fist and press upward the area between the navel and ribs. • In case of unconsciousness, take the child to the hospital immediately. • Have a close watch on your children at all times. • Remove any small objects that could cause choking, even if they are anywhere in the vicinity of your child. • Do not give raw food. Steam the vegetables properly to make them soft. • Do not give small, round food which can get lodged in the airway. • Avoid putting your finger in the mouth in case of choking, as this might push the object further in.